I recently bought a Kindle from Amazon. Reading books on a book reader instead of a computer screen is less tiring and more comfortable. After a few weeks, my mom bought a Kobo Touch and I started to compare it to the Kindle. Apart from the touch features, a functionality that the Kindle is missing is the ability to synchronize it to your Pocket account. So let see how to sync pocket articles to Amazon Kindle. Amazon offers a browser extension called “Send to Kindle” that you can use to send web pages to the book reader, but I wanted the ability to save articles to Pocket and read them on my Smartphone as well as on the Kindle. If you don’t mind to paying 6 dollars every year, you can use en2kindle. This service allow you to send Pocket and Evernote articles automatically to your Kindle. Unfortunately, the service is free only for the first week, so I started to search for a way to do it for free. In this article I’ll show you the steps for sending Pocket articles to the Kindle using IFTTT and Instapaper. The steps seem complicated but they are not. What we are going to do is to configure IFTTT to sync Pocket articles to Instapaper. From there, we will instruct Instapaper to send them to the Kindle. I didn’t want to directly switch to Instapaper because i like Pocket and the Instapaper Android app is not free. So let’s start! Go to IFTTT.com and create an account if you don’t already have one. Then, create a new Recipe and select Pocket as the “This” and select the option “Any new item”. Pocket will ask you the permission to grant access to IFTTT. Now the “This” part of the Recipe is complete. 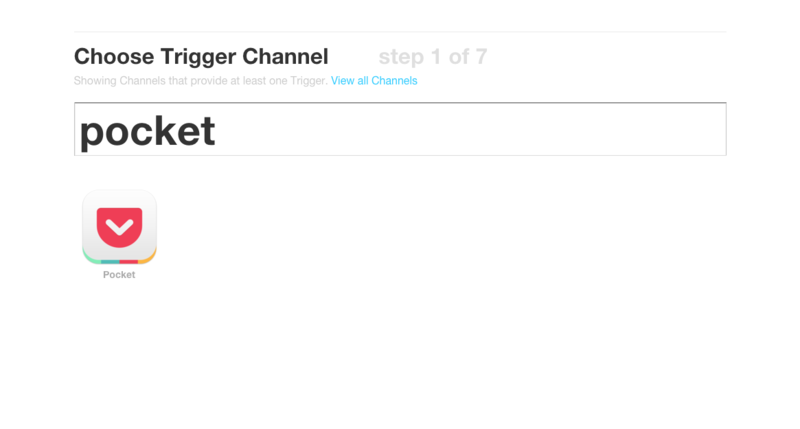 Click on “Create trigger” and then on the “That” part. Search for Instapaper and select it. Then, click on “Save item” as the desired action. You can leave the default values for the following form. Finally, click on “Create Action” and then on “Create Recipe”. Now, when you add an article to Pocket, it will be saved to Instapaper too. The reasons for duplicating the Pocket articles on Instapaper is because Instapaper offers the opportunity to send articles to the Kindle on a scheduled basic. Let’s see how to do it. First, go to your Instapaper account (or create a new one) and open the Settings page (from the menu in the top right corner). Scroll down the page until you see the “Kindle” section. There, specify your Kindle email address. For knowing it and to authorize Instapaper to send emails to it, you need to go to your Amazon account (there’s a link in the page). In your Amazon account insert the email address provided by Instapaper and note your Kindle email address. Then, copy it to Instapaper. 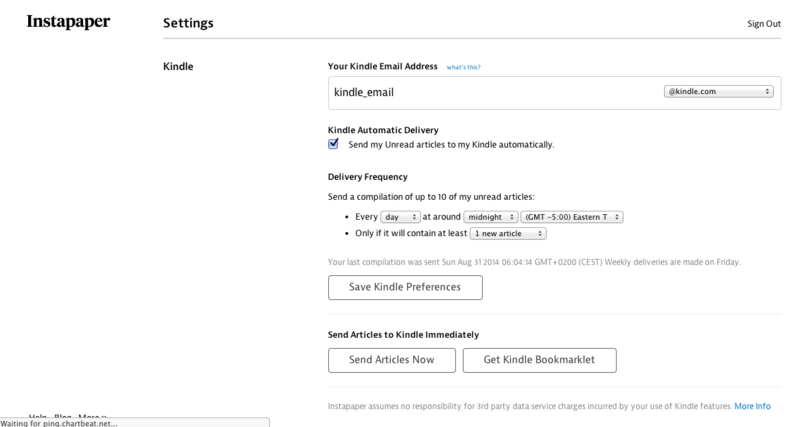 Check the “Send my Unread articles to my Kindle automatically” option and choose the frequency of the updates. With this method, the articles won’t be sent immediately, but you can choose for them to be sent every day. Save the changes and you’re done. This method is not perfect. First, articles can be sent automatically from Pocket to the Kindle once a day at a specific time. Then, this is a one-way synchronization: if you read articles on your Kindle, they won’t be marked as read in Pocket, nor in Instapaper. But, it’s a free solution, and it works pretty well. If you have any question, post it in the comment section below! IFTTT with pocket and instapaper works fine, but it makes a digest of all articles in one “kindle book”. I don’t like that approach so far, but readability does the same freaking thing. Have you tried it as well? I do like instapaper digest layout better, but I’m still looking for some way to do it without a grouping everything in this way and I fear fivefilters would be the best (and most expensive) way. I made it just now, thanks a lot, it seems it synced 5 articles, maybe I only got 5 in Pocket, so is it a limit? Only 5 articles per time? I’ll try it later.